Fr. 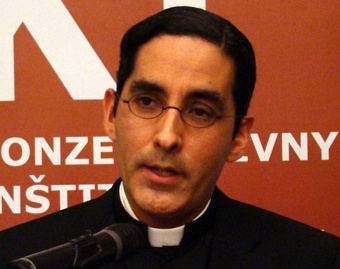 Marcel Guarnizo, a philosopher, theologian, and activist involved in economic and cultural issues in Europe and the United States, gave this address to the Fortnight for Freedom Campaign's June 30, 2012 seminar in Purcellville, Virginia. This event during the Fortnight of Freedom seeks to be a response to the Holy Father’s call and the call of the bishops of the United States to cooperate, educate, and seek to defend our constitutional freedoms in our American democracy. In this effort we join not only Catholics but also other believers and people of good will who understand the danger the republic finds itself in. I will present a more theoretical understanding of the right to religious freedom in our post-modern world and the praxis or practice which has nearly completely superseded the theoretical analysis of this problem. I think the new practical approach is a mistake, and I think so because good practice follows only from good theory. I hope that what I have to say will convince all of us here that we must engage in an educational effort on the basis of good theory, for far too many Americans are being duped or not paying attention to the real threats of our time. Jefferson once wrote that a democracy cannot remain both ignorant and free. This is something to think about: It cannot remain both ignorant and free. The events of last Thursday [the U.S. Supreme Court decision upholding ObamaCare], put a dramatic, urgent note on what we’re doing here. I will try to talk toward the end about practical things that can be done and some of the practical implications of where we find ourselves after the decision of the Supreme Court to uphold the Obama mandate and the healthcare law. I think most Americans are starting to wake up and realize that they can no longer sit on the fence; that we must act and we must participate in the public square in the debate, for the result of this debate, I would argue, may alter or preserve the American democracy for future generations. This excursus into the history of religious freedom is a complicated one particularly once we get to America and how the idea of religious freedom filtered down to the Constitution and then to the Bill of Rights. I’m not going to revisit that. I think it’s a complicated problem and I think there are different interpretations of the problem. But in the general, more macro level of the problem, religious freedom has always been a question and the struggle to preserve religious freedom is much more ancient, of course, than our own Constitution or the Bill of Rights. When Moses was asked by Yahweh to lead the people of Israel out of Egypt, it was a problem of religious freedom. A lot of people think that Yahweh was emancipating the slaves but that is not what Yahweh said. This is clear if you read Exodus, chapters 5-8. In Exodus 8:1 for instance, this is what Yahweh says: “Let my people go that they may serve me.” This is important: the end of freedom: “that they may serve me.” Moses told the Pharaoh, “We will go three days’ journey into the wilderness and sacrifice to Yahweh our God as he shall command us.” Notice, he was asking for permission to go for three days and worship. It wasn’t a request for emancipation or abolition of slavery. This is the first point: There are bigger, more important things than political freedom. Religious freedom and cultural freedom supersede, hierarchically, political freedom. This is true, although, as the Israelites would find out, political freedom is necessary in order to preserve religious freedom. That’s why they get emancipated―because they cannot continue to serve and worship God without political and economic freedom. Pharaoh said, Exodus 8:28 “I will let you go that you may sacrifice to Yahweh, your God in the wilderness, only you shall not go very far away. Pray for me.” This is completely a religious freedom issue. The Israelites are going to worship, God has commanded it, and they’re asking precisely for that. In fact, that’s all that Yahweh was asking for in the beginning. Moses said, “Behold I go out from you and I will pray to Yahweh” but of course, as we know the story as it unfolds. Exodus 8: 32 “Pharaoh hardened his heart this time also and he didn’t let the people go.” Pharaoh refuses to let them go, the plagues come, and political freedom comes as a consequence. From the beginning of the Judeo-Christian era we have faced this problem: Religious freedom is denied by the rulers. It tells us clearly though, as I just pointed out, that there are different hierarchies and the freedoms that need to be preserved in a democracy but also under every regime that exists; and they always exists together. The notion of political freedom, economic freedom, and cultural freedom are interlocked. They go up and down together. So, if you lose cultural freedom you will lose more political and economic freedom. If you lose economic freedom you will lose political and cultural freedom. I could give many examples of this. But suffice it to see the experiments of the socialist revolution: The more economic power the regime gained, not respecting, for instance, the rights to private property, the more cultural freedom was denied to the people and the less religious freedom, freedom to worship, the populations had. We now face the same problem even in our own nation. As we lose cultural freedoms, we see that, more and more, inalienable rights cease to be respected. It becomes less and less of a problem therefore for a government to take away economic freedom and political freedom. I would argue that the big first loss of cultural freedom in this country was 1973. And of course I am referring to the Roe vs. Wade decision. The moment you allow the government to cross that line of the first inalienable right, the right to life, all other rights cannot be secured, theoretically speaking. So it’s a question of time; it’s a question of political maneuvering, but that first right being conceded opens the floodgates to the loss of economic and political freedom. Cultural freedom is composed of two things in a democracy: The religion of the political society that we’re speaking of, and in this case we’re speaking of Western civilization so therefore the religion of the West, the Catholic faith; and the philosophical presuppositions that underlie the notions of the institutions, laws, and ethics of that society. Very generally, we talk about the three hills on which Europe and Western civilization were built—the combination of Roman law, Greek philosophy and the Judeo-Christian tradition. There was a big debate in Europe concerning the preamble of the Constitution of the European Union: Should it include Christianity as an historical element that impacted, influenced the creation and formation of Europe. Ultimately, it was decided to exclude all references to Christianity. This is a tragedy. And it is simply contrary to historical fact. What we knew as Europe at the time of Charlemagne―which was known as Christendom―was called “Christendom” for a reason. The historical argument is inescapable. But it’s important to realize that the Catholic Church was not just a midwife of Europe, influencing, impacting the birth of Europe. No! The Catholic Church gave birth to Europe, is in fact “the mother of Europe.” At the time, the Golden Age of Greece had long disappeared. The Roman Empire had fallen. The Church actually held it all together to bring about what we now know as western civilization. That would come to us, as Russell Kirk elaborated in his book The Roots of the American Order, via London and Philadelphia. If you read Kirk’s book, you will see how western civilization was brought historically to the United States. So you see how important this is: Whenever our forebears thought of liberties, freedom of religion was the first. It is interesting that we’re at Patrick Henry College today. As you know, Patrick Henry was an anti-Federalist. The anti-Federalists did not want to ratify the Constitution. Patrick Henry is now seen as the great champion of liberty, probably because of his famous line, “Give me liberty or give me death.” But he did not want to ratify the Constitution. And one of the reasons the anti-Federalists did not want to ratify the Constitution was because they felt that it did not contain sufficient individual protections for the individual, that individual liberties were not being protected. So they argued for and obtained a Bill of Rights, the first ten amendments to the Constitution. The First Amendment of that Bill of Rights protects religious freedom. The Bill of Rights would be ratified in 1791, as you know. Madison was originally not so keen on these amendments as you may know. Jefferson, in a letter, chastises Madison for not including a bill of rights in the Constitution. [Eventually, Madison campaigned for and drafted a Bill of Rights—ed.]. It’s interesting to hear Madison’s original wording of the First Amendment. Wrote Madison: “The civil rights of none shall be abridged on account of religious belief or worship. Nor shall any national religion be established nor shall the full equal rights of conscience in any way, any matter, or any pretext be infringed.” This wording was published in the Congressional Register in 1789. It did not end up like this, as the law of the land, as we all know, but Madison’s formulations help us understand the intent of the founders in including the First Amendment. I like it better than the one we have now. Two things are important which are also present in the First Amendment today but may not be as clear: We are talking about civil rights that should not be abridged because of religious belief and worship. That’s an important thing to say, that all human beings have these rights and they ought to be preserved by the constitutional protections in the United States. The second thing is that no national religion shall be established. This seems to me to be a clear refusal of a confessional state, that is, the establishment of an official state religion, in the United States. It is not, however, as some interpret, the establishment of a wall of separation between the state and the Church. It was denying the possibility of a confessional state. It was not denying the role of religion in civil society. Now, why is this important? It’s important because religious freedom can be preserved under many forms. Not having a confessional state is not a guarantee of religious freedom. A non-confessional state is one form that can be chosen if other guarantees are in place. But there’s nothing intrinsically impossible about having a confessional state that respects religious freedom. A confessional state is not contradictory to religious freedom. I just want to make that point because some people think a confessional state would be contrary to religious freedom, and that is not the case. Malta is a confessional state. The official religion of Malta is Catholicism. It doesn’t mean that you cannot have religious freedom just because you have a confessional state. People worship in Malta under different religions, yet their constitution guarantees a confessional state under Catholicism. It’s not the form that we in the United States chose, but I just want to point out it’s not the only one. Jefferson observed when he wrote the Virginia Act for Establishing Religious Freedom in 1786 that the religion of every man must be left to the conviction and conscience of every man. And it is the right of every man to exercise it as these may dictate. This right is in its nature an inalienable right, so the right to religious freedom inalienable. It is the duty of every man to render the Creator such homage and such only as he believes acceptable to him. So we add one note here: Jefferson is calling religious freedom an “inalienable right,” and I think this is the first thing to know. If someone should ask, “What is religious freedom?” you should start there. Tell them it is an inalienable right and explain what that means. Obviously, there is a relationship between religious freedom and the other two: freedom of speech and the right of the people to peaceably assemble. The right of assembly is here coupled with the right of the freedom of speech. But what is the highest form of speech? The highest form of speech is worship. That’s why it’s first. But that’s why it’s connected to speech. If the highest form, the most demanding in a sense, but the one that perfects men’s nature the most is not guaranteed, all other rights to speech become irrelevant. If you do not have the right to pray, freedom of speech is not fulfilled. Second, the right of association which we’re exercising here―we have a right to associate here―the highest right of association comes when people come together to worship. That’s the point, that the first liberty guarantees. It is a foundation for other liberties that we have and that we need in a political society. We live in a society that does not understand terminology any more, and concepts. This is due to a lot of bad post-modern philosophy in our day and age. So, the first concept we must understand is “religious.” It’s important to understand what religion is before we understand what religious freedom is. The etymology of the word has several possibilities but I will stick to one from which the word religion is derived, which is religare. This ligare is to bind one’s self; to tie up. Religare gives the notion to bind one’s self yet again. (Right? “re” – repetition; religare―binding one’s self anew.) Of course, and the object of this binding, this tying of one’s self is to God, in mind and heart and in action. The fact that there is an amendment on religious freedom, already illuminates one important dispute we’ve had with the modern world which is very important, that this action of binding oneself implies that man is free by nature. Only free beings can do this. This is very important. You must be free to do this. Animals cannot bind themselves to anything. To make that kind of moral commitment, spiritual commitment, it takes a free being. This concept is diametrically opposed to the modernist determinism. The moderns have taught for decades now, centuries, that we are genetically determined, biologically determined, economically determined (such as Marxism), psychologically determined―in short, that we are not free. For all the talk about freedom in the modern world, the moderns have been the biggest enemies of man’s freedom and the biggest deniers that man is free. The Church has stood staunchly as a defender of man and his freedom, of the truth that freedom is a part of man’s nature―we are free beings. We must be free, metaphysically speaking, in order to participate in religion. To perform the act of religion you must be free, and that’s a big, big philosophical, metaphysical statement from the outset. Now the act itself of faith also requires us to be free in our actions. That is to say, faith, if coerced, is no longer faith. The act of faith itself by its nature requires a free act. So you can be forced to confess a faith in which you do not believe against your conscience, but it does not mean you have made an act of faith. You must be free to make an act of faith. The moment that you are not free the act of faith disappears; it is destroyed by coercion. This is why the act of religion cannot be coerced because you cannot possibly have faith if it’s coerced. So you must be free to exercise the act of freedom. Now freedom of religion was always called, “the first freedom” and I want to give you two reasons why that is really important. Notice, it is not the first “right,” so be careful. The first right is the right to life, because if you don’t exist you have no freedoms to exercise. So the first right is the right to life―correctly so. But the first freedom is freedom of religion, and I will tell you why. One reason is metaphysical, philosophical, it has to do with reality. That is to say, the relationship that immediately begins to exist from the moment that you exist, the moment of conception, between you and God, antecedes every other relation you will ever have. It’s before the relation that you have with your parents, political relationships, friends, etc. The relationship to God is antecedent and is not chosen. It is a relation that is supernatural because God is a supernatural being, but in a sense it is natural because it starts from the moment that we come to be. It’s first before any other relation. So, it antecedes all other relations. In the portal of Patrick Henry College there is a quote from Colossians (Col. 1:17) which I think sums it up. It says, “You existed before all things and all things exist through You.” That sums it up. Nothing is before God. Not just morally speaking, because God ought to be loved and worshiped. No, metaphysically speaking, ontologically speaking, nothing is before God in our life. Of course, this is not first to you in your mind. That is to say, you don’t realize immediately upon conception what the first relationship is. That is a subjective thing. You have to come to realize that. But that it is ontologically first is without question. The first things that come to your mind are the things that exist in reality. And from those and the causes you reach the effects, the cause, namely knowledge of God. But ontologically this is first. It is also first in another sense―hierarchically. It is the most important relation that we have. So it is the first in the realm of being but it is also first in the moral order, hierarchically. It is the most important relationship that we have. In fact it is the relationship to which all other relationships and actions of man as a moral agent are ordered to. So it’s the end of all other relationships and actions, and that is an important thing. That is why all other relationships, in a sense, are subordinate to the proper ordering of this relationship. That’s why St. Thomas More said he wanted to serve the king but God first. This gives you an idea of why it is an inalienable right. It is “inalienable,” meaning it cannot be alienated from us; it cannot be taken away from us. In the realm of being, it’s impossible to be alienated from this. It is possible through the positive law to obstruct the proper exercise of the first relationship or the first freedom. But in the moral realm it is inalienable and therefore outside the jurisdiction not just of the state but any other intermediary structure in society because the origin of the freedom does not derive from that instance ; it’s not derived from the state, it is not derived from the intermediary structures ; it is derived from a source outside of the temporal order. In fact, the relationship is supernatural; it is beyond the temporal. Therefore, the state has no jurisdiction over inalienable rights. It is not a grant of the government; it is not something the government can negotiate with. It is not something that you depend on the government to receive. It is given to you because you are the kind of being that you are. The human nature that you possess gives you, as a free being created by God, this inalienable right. So whenever it is obstructed, it will always be an injustice because the government is going outside of its own jurisdiction. It is violating rights that are prior to the constitution of any government. Now, to the second part of the problem, the notion of freedom, which is really problematic and I will be brief on that, but I think it’s important. We say, “freedom of religion,” but it is important to know precisely what we are saying. The notion of religious freedom that the Second Vatican Council presented was highly objectionable to people like Marcel Lefebvre because he thought when we say, “freedom of religion,” he felt that it was, in a sense, religious indifferentism; that everybody is free to believe whatever they want to believe; that there is no ordaining category; there is no true religion; everybody can follow whatever they wish; a sort of religious indifferentism or religious relativism. Marcel Lefebvre would eventually break away from the Church on this issue. So I want to show you how that it not the case, that everybody is free to believe whatever they want to believe, though in America religious freedom is understood like that, unfortunately. We will not even talk about what actually constitutes a religion, but in America any belief is synonymous with religion, so I just highlight that. Belief is not a synonym of religion. We have religious believers and we have believers. But to be a religious believer you must meet certain requirements. So Wicca, Christian Science, these things are not religion even though they’re treated like religion. It would be easy to show philosophically how they are not a religion. In any case, the key here is that there are three types of freedom, or three orders of freedom, that you have to keep in mind to understand the problem. The second clause of the first part of the First Amendment, that “…Congress shall not prohibit the free exercise thereof…” (meaning religion)―there is physical freedom, the capacity not to be coerced, not to be constrained; the capacity to take action in the world and not be constrained―that is physical freedom. This is clearly necessary for religious freedom, right? If you’re stuck in a dungeon being tortured, your physical freedom is being impeded. Or if you’re being forced to go to worship or to a communist propaganda parade or something, you are coerced. Second is psychological freedom. In order to have religious freedom you must have psychological freedom as well. This is the possibility for the intellect to pursue truth in accordance with its capacity or the knowledge that it has. You cannot be brainwashed and say you’re exercising your religious freedom. These two must always be guaranteed: Physical and psychological freedom. So, you must be free to worship where you want, you must be psychologically free to choose to worship if you so choose in accordance with the dictates of your conscience. This is the problem of religious indifferentism. Some people will say the post-secular version of this is there is no truth that we can discern; no religion can be true, therefore everybody has a right to believe whatever they want to believe. So, I want to correct that on the nature of the last form of freedom: moral freedom. You are not morally free to believe whatever you want to believe. This is where the accountability comes and religious relativism and indifferentism is stopped. It is not true that in the exercise of religious freedom, vis-à-vis God, whatever revelation you believe, whatever religion you believe, is completely equal and indifferent to God. That is not true. You are not morally free not to pursue the truth that the intellect seeks at its highest level, namely the pursuit of religious freedom. It is not true that you’re free to go against your conscience if God has called you or you have seen the revelation to be true. The Church affirms, of course, that there is no salvation outside of the Church (ex ecclesia, nulla salus). It does not mean that only Catholics go to Heaven. It does mean that if by neglect, obstinacy, rebellion or sheer laziness of not knowing what you should have known vis-à-vis religion, you will be accountable. You are not morally free to just believe whatever you want to believe. You’re not accountable to the temporal powers. That’s the difference. You’re not accountable to the state; you’re not accountable to an inquisition. You’re accountable to God but you’re still not morally free and that is what prevents religious indifferentism. There is one, true revelation and metaphysically speaking only one is possible because God neither changes his mind nor has opinions about matters. So there’s only one Divine revelation. So yes, you’re not free morally to believe whatever you want to believe. God will judge given the graces that you have received in your life, whether your choices were in accordance with conscience, and only God can judge that. But there is no religious indifferentism. Do you see that? The pursuit of truth requires you to be intellectually free to pursue truth. You have to be free to explore, to seek the truth in religion freely. Example: A lot of post-modern parents don’t want to teach their children religion because they want to let them choose when they grow up, to be free to honor their dignity and they will choose. Of course they end up without religion by the time they’re 15 and then they regret their choices. The problem here is that their argument, completely theoretically flawed, is that education is coercive; that to educate somebody is to coerce them or to inhibit their freedom. This is why liberal arts existed because they free man from ignorance and the highest form of learning is religious. But you must be free. You cannot be indoctrinated. If you’re a child in a madrassa school and the teacher is indoctrinating you to commit suicide on behalf of God, this is contrary to psychological freedom. There may be a twelve year old child who commits a suicide bombing attempt thinking that he’s really obeying God. But I don’t think he’s psychologically free. So we have must have the freedom of the mind to pursue truth which is the highest objective. There is a lot of talk about the notion of tolerance; we must be tolerant. A lot of Catholic die-hard conservatives don’t like the idea of tolerance. It’s like anathema or the liberal code word for “relativism.” But I love the notion of tolerance. I’ll tell you why. Of course “tolerance” in our day has come to mean we must tolerate all opinions. They’re all of equal value because there is no truth. But that’s an improper definition of tolerance. Tolerance already denotes philosophically that something is true. The reason you tolerate a departure from the truth is because something actually is objectively true. If everything were equally false you would need no tolerance. If everything were equally true you would need no tolerance. You have tolerance because there is an ordering principal and things are departing from the ordering principal in different degrees. So you tolerate the departure from truth. So toleration immediately states that there is objective truth. Do you see that? Put it this way: Where you don’t have dogmatic truth you don’t need tolerance. If we were choosing the color of a car and one of us preferred pink but another would choose black, there is no need for one of us to tolerate the other’s choice, per se, because there’s nothing intrinsically definitive about black over pink. Toleration comes when you have something objectively true and you’re tolerating departures from the truth. We must be tolerant because that is an affirmation of the truth and it is the intellectual space required for others to seek to arrive at the truth. If you’re not tolerant, you’re denying psychological freedom to other people to explore and seek the truth. So, the first phrase of the First Amendment is: “Congress shall make no law respecting an establishment of religion,” meaning a confessional state or a religion that would be intolerant of the possibility of others to worship or have freedom of religion. The second part is, “or prohibiting the free exercise thereof.” This is important, the positive first side of religious freedom, but the other side is the exercise of religious freedom. This is the philosophical side. But religious freedom, I would argue, is at least composed of three things. True religious freedom is composed of three things: worship, action, and doctrine. So part of religious freedom is a freedom to worship, but this is not even by a long stretch the fullness of what religious freedom means. To be allowed to pray and only to pray, is not to have religious freedom guaranteed. This is what the pope was saying in the first quote I read you. Some bishops were telling him that religious freedom was being constrained to mean only freedom of worship. If you hear the Obama administration speak about religious freedom they will often say, “freedom of worship” because they mean it is to be confined to private religious services. In the post-modern world, the notion of religion was that we have to privatize religion; that religion has to be circumscribed to the sacristy, to worship, to religious events, to religious rituals which have no meaning except to those who are believers. Today’s most sophisticated atheists―Joseph Sabia, Gianni Vattimo, Richard Rorty―all say that they do not object to religion as long as religion is privatized. As long as you keep it to freedom of worship, they don’t care. So, they are among the post moderns. Why? Because they are arguing theoretically that there is no truth in religion, that religion cannot derive any truth, it cannot determine what is true from what is false. Therefore, religious beliefs are emotional crutches, that people need in order to get by in life. So the Mormons believe this, the Catholics believe that, it’s like the opiate of the people. Let them have their drug; let them have their crutch. That’s it. So we’ll let them have little religious ceremonies. But the religion of the Israelites and Christianity does not limit itself to worship. There is no dichotomy or schism between worship and action, or worship and doctrine. It is all one thing. Therefore, part of religious freedom is a right to profess one’s doctrine and actually to teach the doctrine to others. So you have in Canada people trying to forbid homeschoolers from teaching and using the Bible to teach their kids. That’s a violation of religious freedom. You have public schools which now claim that religion cannot be taught in public schools. This is completely contrary to the idea of the Founders. It’s a violation of religious freedom. You have many who theoretically want to forbid the Church from participating in the public square. The arguments of the Church are irrational because they depend on theological assumptions, they would argue. You don’t have religious freedom if you cannot uphold the doctrine of that Church which you believe in or do what revelation asks of you. And finally action: We are called by God in divine revelation to transform the culture in our world; to have institutions to promote man’s good, natural and supernatural. To forbid that is also contrary to religious freedom. So, to have us shut down orphanages in Washington, D.C., because the Church objects to giving children to homosexual couples, for instance, is contrary to religious freedom. The possibility of shutting down hospitals on moral objections is contrary to religious freedom because this is part of what it means to have a religion. Religion does not just mean that we pray and that we are in our sacristies. Now, so the first clause of the First Amendment guarantees no coercion, which is necessary as we saw to freedom of religion and the second clause guarantees, of course, the free exercise of religion. Now, I would say this: The First Amendment is really, really good law. I would like to argue that even the philosophical and theological presuppositions that I’ve been speaking about really, really were comprehended in the drafting of the First Amendment. There are a lot of interpretations of the First Amendment. The very radical Protestant interpretation makes the First Amendment almost like a dogma of religion. It’s like a providential, sacred thing by which the United States was founded. The second, which is a secular interpretation, is that it was intended merely to be sort of a secular accommodation to prevent, as it were, fighting among a plurality of religions. I would disagree with both. In his famous book, We Hold These Truths, Father John Courtney Murray called the provisions of the First Amendment “articles of peace.” Basically his argument rested on the notion that, in the pursuit of the common good and peace, these articles were presented to assure peace in a pluralistic society. I think that John Courtney Murray makes some pretty good arguments, but I disagree with that too. Peace is a fruit of justice. The reason the provisions of the First Amendment worked, and have enabled us to have political stability even in a plurality of religions, is because they were true. They were true to the nature of man and the philosophical assumptions behind them were true. Peace is the fruit of that truth and that justice, that proper freedoms were observed for all American citizens. I think it is good law for these reasons: First, it created a social environment protected by law in which men of different religions, faiths, might live together and flourish in peace. That’s a big, big accomplishment. That is to say, we proved that, without uniformity of religion, it is still possible to have a plurality that functions in a stable manner. Before that, dating to the Augsburg Accords of 1555, the basic rule was, “We follow the religion of the king, everybody does.” But we’ve proven that it’s possible to have a different form, a plurality of religion, but still a stable, political environment. Second, there’s another very important thing that’s compatible with Catholic social doctrine. The First Amendment keeps a clear distinction between the spiritual order and the temporal order. It immediately delineates this, by stating that it is a right, inalienable in that sense, that the temporal order not have jurisdiction over the spiritual order. But, also, in preventing a confessional state that would supersede civil liberties―which was the historical experience of the Founders―the spiritual order cannot overrun the temporal order. The First Amendment asserts that the spiritual and the temporal are two different realms, with proper jurisdiction and authority that may intermingle, the spiritual being higher, but each existing in its own autonomy. Third, I think it fantastically upholds the theory of limited government. It immediately states that the government that we created, that we agreed to, is limited; that it cannot absorb the citizen and intermediary structures by its own fiat; that it is not omniscient; that it is not competent to judge in matters theological. So it really created a vision of limits to the government. And that’s really important. If you allow the government to transgress inalienable rights you will end up with no rights. And this was the big danger of 1973. If you’ve conceded the first basic right―the right to life―there’s no theoretical reason to hold that any other right is inalienable. You just gave up on the biggest one. So it’s just a matter of time, just a matter of working out the politics of how less freedom is given to the citizens and more freedom is absorbed economically, politically, and culturally by the state. We’ve lived, “with the accommodation of Roe v. Wade” for over 40 years. That was the line in the sand, and people like Von Mises used to say, “when the government crosses that line, you’re into unlimited government theory.” I would argue that the present administration believes in unlimited government theory. Whatever you want to call it: the welfare state, neo-socialism, socialism, whatever you want to call it―it’s the road toward loss of freedom. And finally, I would argue, to the practical side of this problem. Why is it so important that this famous mandate be passed and, lamentably, that it was upheld by Justice Roberts? I myself was quite disappointed. No one knows why he did what he did. I think he was completely mistaken and I agree with the commentary and with the dissenting opinion of the minority on what Roberts was doing. I don’t think it’s the law and the job of the Supreme Court to rewrite laws for the administration. Clearly, even the majority agreed that, under the commerce clause, this was unconstitutional and it was over reaching by the administration. But, for whatever reason, this is the situation that we now have. Why is it important? I would argue this: In a democracy, in a modern democracy in any case, you always have three things. You have the state, what you call the state and the organs of the state. You also have what are called intermediary structures. That is to say churches, schools, private operations, etc., the private sector as it were. And finally you have the private citizen. The private sector—civil society—is the natural buffer zone between the government and the private citizen. If the aim of government is to increase the power of the state, the jurisdiction of the state, even beyond inalienable rights, swallowing inalienable rights as it would be, a case of life and now, the first freedom, freedom of religion, then you need to disappear, in order to get to the citizen, this natural buffer zone. You need to disappear intermediary structures in order to directly control the life of the citizen. This is why the anti-Federalists wanted a Bill of Rights to protect individual liberties. Now, what stands as the most colossal intermediary structure right now in the health care debate? It’s the Catholic Church. If you’re attempting to take over one-sixth of the economy, which is what the medical sector would be, but one out of six patients is under Catholic health care in some shape or form, you have a real problem, because you cannot have a total nationalization of health care, in practice, unless you deal with the Catholic Church. So there are only two ways to get this done, obviously. The first way is to disappear institutions that are run by that intermediary structure which is the buffer zone between the state and the citizen. Shut down the orphanages, possibly shut down the hospitals, whatever may happen. This is a big practical problem, though. There are easier ways to make this happen. The first is to make the Catholic institutions subservient to the needs of the state and to the will of the state, to make them comply with what the state demands without rearranging the entire practical structure which would be a big problem. One out of six patients without health care, if we shut down Catholic institutions completely, would be a disaster. So the other way is to coerce them to do what you would do if those institutions were yours. So basically, to make private hospitals and institutions of the Catholic Church functionaries, organs of the state that would implement your policy. And here the mandate is very useful. This is like the book of Maccabees: To eat of the forbidden food, to take a bite. In that case, seven sons died because they would not eat impure food. The HHS mandate says to the Catholic Church: We intend to make you participate in something that you have refused to eat for 40 years, so to speak, from “the fruit of the death culture.” We will force you to do it because clearly you are not going to do it on our own. So now we will pass an edict, positive law, that obliges you to “take a bite” and you will be paying for it. As the pope says in his warning to the American bishops, participating in intrinsically evil practices, from contraception to abortifacients, if you do that as an institution you are no longer of the same nature per se, the same moral and spiritual tenure that you were. If you were to take but one step in that direction it doesn’t matter. Just one step in the participation in intrinsically evil practices—would transform Catholic institutions into state hospitals—the Church becomes a state church. This is where they’re going. That’s why we’re here. The mandate is designed to deal with this intermediary structure somehow. The second reason we’re here is not because of contraception. That is a ridiculous claim. All the people that are celebrating the continued victories of the Administration are the abortion groups and the abortion industry in the United States. But their business is not contraception. They will give you contraception for free because they know what really makes money, which is abortion. How do they do this? They calculate that if they make the issue about contraception this is quite popular in our contemporary society because apparently many, many, many women and men use contraceptives. (Not 99%. That was an absolutely absurd number. It’s totally ridiculous.) That may be true. So they are banking on the fact that this is a winning issue. If we make it about contraception, people will vote for us, women will be scared, the “the war on women,” and they will vote for us. It will also divide the Catholic Church from other Christian churches, because most Christian churches have already collapsed on contraception but not on abortion. And you see when you go to these rallies (I know myself. I’ve been to many), it’s very difficult to get a Protestant pastor to come out and speak against the mandate because they say, “Well, we are really not against contraception.” It’s a pretty good divisive issue to isolate the one intermediary structure which is a problem and which stands in the way of the state nationalizing the health system completely. The third reason we are here relates to the HHS Secretary, Kathleen Sibelius, who I think is a nemesis to civilized life. Sibelius is a longtime friend of the late term abortion industry and the abortion industry. This is no secret and I tell it everywhere. One of her biggest supporters when she ran for Governor of Kansas was George Tiller, late-term abortionist. He had a political action committee to support her and was one of her greatest contributors. She, in turn, ran cover for him when he and LeRoy Carhart, who used to work with him, were being investigated. The abortion industry wants to make money, not on contraception, but on abortion. A procedure, late-term abortion or any other abortion, can cost from $500 to $8,000, depending on the term, how late in the pregnancy the mother is. But if you can pay with an insurance card for abortion, the abortion industry will be loving life. Because to come up with $8,000 to do a procedure is not a small amount of money for a young woman who is pregnant or someone who is poor, etc. But if you can just show an insurance card, that would be fantastic. Now they cannot say that the mandate, (which I call totalitarian because it wants totality of American citizens to participate in it, so it’s totalitarian in that sense) is about abortion, because that is not a good issue. You can’t sell that before an election. So they will say it’s about contraception, pass the mandate, uphold it (unfortunately it has been upheld by the Supreme Court) and then once you win the election, you will say, “…but abortion is already the law of the land since 1973, and it’s something that we consider health care.” So then you throw abortion in once you have the mandate and everyone is obliged to pay for it. Every American taxpayer will then be paying for abortions regularly. You throw it in after you get the mandate done because you already have Roe v. Wade assuring you that abortion is legal and is the law of the land. This should not be called the “contraception mandate.” It should be called the “anti-religious freedom mandate” or the “abortion mandate” and we should explain why. I mean, this is really what Sibelius is after. She’s after abortion, not contraception. What is to be done? Our bishops have been calling for dissent. I’ve heard and read many statements from, “This is the time of Henry VIII” to “We must do something.” The times of Henry VIII were very difficult. As you know, John Fisher was the one, lone bishop that survived that sort of persecution (survive morally, to stick by the truth). But I don’t think we need to use too much hyperbole. No one is talking about getting beheaded, no one is talking about any of these things right now. I mean, to invoke Henry VIII in such things is not to take the question seriously. They’ve talked about dissent and here we are talking about religious freedom. The problem is what happens in November if Obama wins, of course. Then you really have to make decisions if we’re really going to be paying for all of this. I would say there will be some theologians who will try to argue that this is material cooperation but not formal cooperation and therefore it’s licit to cooperate. I would argue that that is a complete ruse and remember that before this happened they were saying that was unacceptable. If you later hear that it’s acceptable, morally acceptable, just go look at the articles when they said it was not acceptable. What is also not acceptable is an exemption for the Catholic Church. Morally speaking you can only ask for an exemption (and I told this to one cardinal who will remain unnamed, I think he didn’t like it very much) exemptions are not possible as a moral claim if the law is intrinsically evil or unjust. So, I cannot ask as a Catholic Church to be exempt from slavery. So you can enslave everybody else as long as we’re exempt. You cannot ask if the Jewish people are made to wear the Star of David that we don’t say anything against that law as long as we’re exempt. You can only ask for an exemption from a law that is just but that you have moral objections to, like war. War could be just but it is true, the Quakers and others may have some moral objection and so they have a conscientious objection. But war itself is not intrinsically evil. You cannot ask for an exemption for something that is intrinsically evil if that is what we teach, and that is what we teach. We have to fight something that is intrinsically evil. Not only will we not accept an exemption, we will fight it. And then we have to figure out how. An exemption is morally incorrect for Catholic bishops. (In the beginning they were looking for an exemption and now they are not. I am glad to see they are not. I hope they hold their ground.) It is incorrect, because a parish could get an exemption; the pastor could get an exemption on his three employees in the rectory. What happens to the Catholic businessman who runs a corporation, an office―he’s a dentist, he’s a doctor? They’re as much a part of the Church as we are. But they cannot ask for an exemption and they have to participate in intrinsically evil practices. We’re always talking about the lay people and how important the lay people are. No! We stand with our people! There’s no exemption for them, there’s no exemption from an intrinsically evil law, so there should be no exemption for us. It’s a non-starter as a moral argument. Furthermore, there are people who are not Catholic because the things that we’re objecting to can be perceived by any person of good will to be contrary to right reason, that they are evil. They must be exempted. And that means that everybody would have an exemption and therefore there would be no law. So there’s no other choice than to fight the law in its totality, as being unjust and intrinsically evil. It’s important to remember that this is not just a question of Catholics and religious believers. These things are contrary to the law of God because they’re also contrary to reason and God is the author of both reason and of Divine revelation. And I’ll close with this: There are two levels. When my atheist acquaintance finds abortion, abortifacients, and the rest objectionable because he can reason his way to this, we say the action is evil; these things are evil. But if you also find them to be contrary to the Eternal law because you happen to be bound to God and God’s law as well, then you say that it’s a sin. So the violation of Eternal law is called a sin. But the violation of the moral law and of right reason (natural law) is evil. So, at the level of the non-believer this is still evil or good. We can still have the discussion and still have people who don’t believe on board. It is evil to violate our freedoms, it is evil to violate religious freedom, it is evil to do all of these different things that are objectionable. At the level of believers, we say it’s a sin because we recognize it as God’s law so breaking God’s law makes it a sin. It’s the same evil. So this is not just a religious question. This is a question of democracy and I argue that the present day notion of democracy cannot sustain the foundations and the principles upon which the United States was created because our citizenry no longer believes in the possibility of truth, metaphysical principles or theological truths. And without truth you cannot sustain the consensus that was reached in our founding documents. It is impossible. We as a people no longer uphold the reason why the United States was created in the way it was and this is why, frankly, the administration has no problem eroding or pretending that there is no national consensus on these issues. National consensus is not a moving relative target. National consensus was reached in the foundation of the United States. What exists today is a lack of respect for the national consensus for which the United States stands. So they’re trying to change the consensus: Religious freedom is not that important; life is not that important because the postmodern believes in the national consensus that is always a moving target. The national consensus for them is not what the Founding Fathers decided. It is what the democratic procedure can evolve into so it is a constant, moving target. If we continue this way we will not just lose our religious freedom but other freedoms as well. Question: Where and what should we teach? Answer: I think you just do what you can and teach where it’s possible. The bishops are the first teachers of the faith and they are in charge of the Catholic universities and the Catholic institutions. They have a responsibility before God and the common good to make sure these things don’t happen. We have to try. But I think unless we understand the problem philosophically, deeply what has happened… these things on freedom and abortion, are symptoms of the problem. It’s not really the problem. The problem is the whole philosophical culture of the west is vanishing, not just here, but all over Europe because we as a people no longer understand the philosophical, religious, metaphysical foundations of Western civilization. So if you don’t understand that, you’re just getting different problems in different places at different times and so we have to really try to deeply teach, and I argue teach Catholics even, philosophy or metaphysics so they understand the problem. This is not just a doctrinal question. We’re not opposed to these things just because we have some weird revelation that says, “Abortion and contraception are wrong.” It’s important not to be isolated in that sense, like the Jehovah’s Witnesses would oppose blood transfusions on some kind of doctrinal issue, their religion that forbids blood transfusions, which is contrary to reason. No! Our objection is not that. Our objection is that what they are doing is irrational, that is to say, contrary to right reason. It violates the Eternal law because whenever you violate natural law, the law of reason, you’re also violating Eternal law. It’s not because we have some weird revelation. It’s because these things are really evil and anybody who has reason could see them. So it’s not a question of, “Oh these believers who imagine these things to be wrong…” No! They are wrong for everybody except that our faith also confirms us in the notion that reason gives us, that these things are evil.